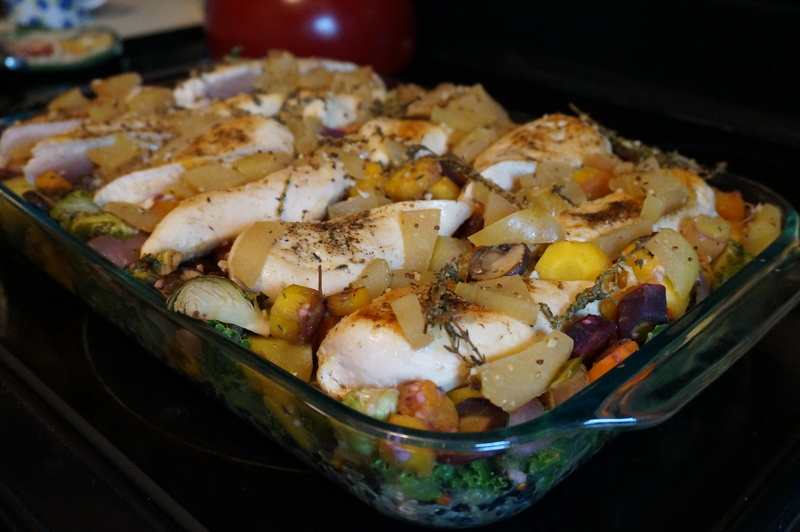 Since it’s fall now, I decided my “meal of the week” (read: large casserole that will make leftovers for about 12 days straight) should be some sort of roasted vegetables with an ode to apples. I was over by Trader Joe’s this afternoon, and they were sampling out little cups of the most DELICIOUS spiced apple cider, so of course I had to buy a gallon. 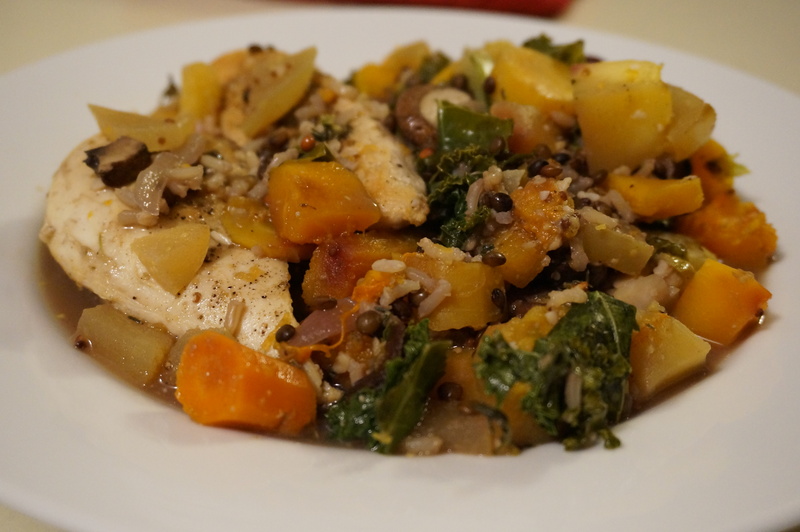 The result of my shopping trip was this roasted root vegetable medley, layered on top of a mixture of brown rice and lentils (inspired by my Chicken Marsala Rice Bake from a few months ago) chopped kale, and topped with chicken breasts and dijon apple cider sauce. 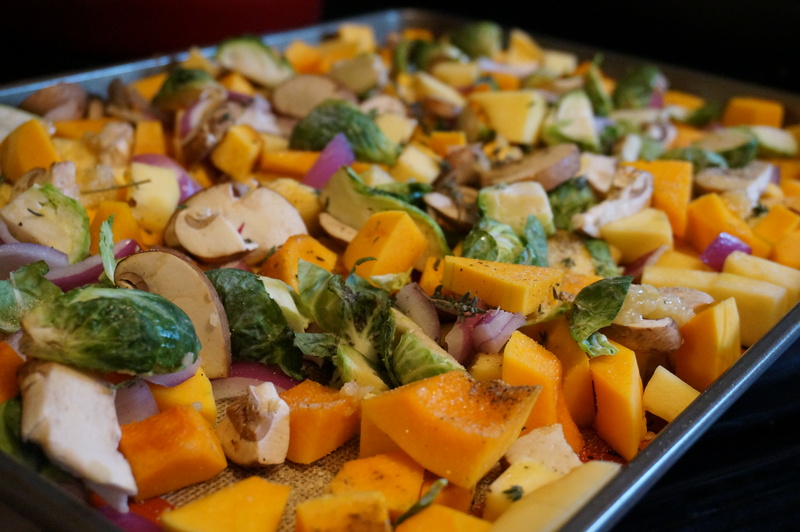 I infused a few sprigs of fresh thyme into the cider sauce, as well as into the roasted veggies, to give it a little more harvest flavor. 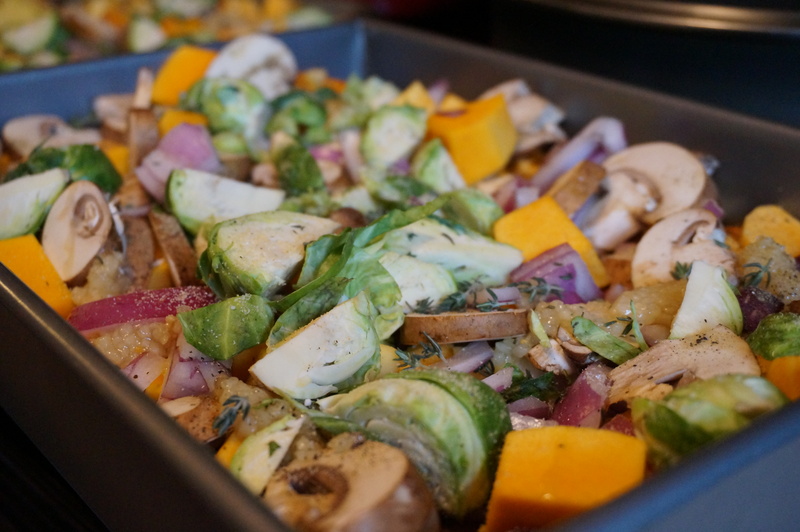 Chop squash, carrots, brussels sprouts, mushrooms, and onion, and toss in a large baking pan with 1 tbsp olive oil, garlic, 3 sprigs thyme (stems removed), garlic powder, salt and pepper. Roast 15 minutes, stir, and roast 10 more minutes. Meanwhile, heat remaining 1 tbsp olive oil in a skillet on medium high. 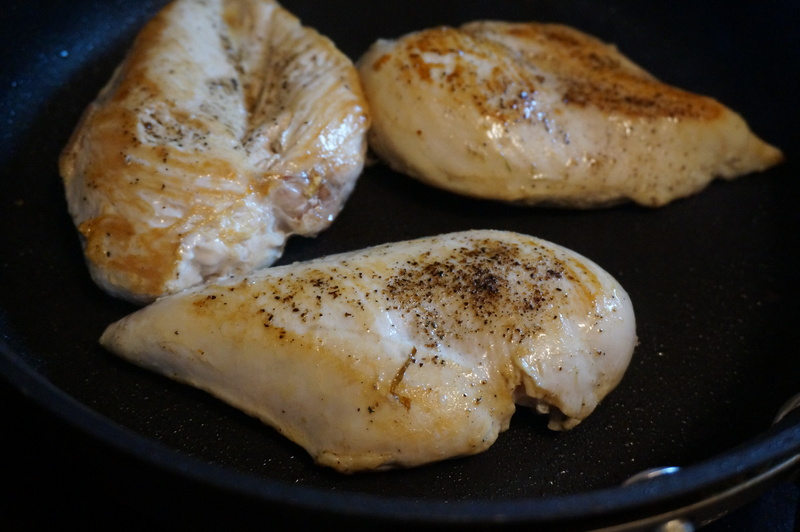 Add chicken breasts and sprinkle with salt and pepper. Sear until just browned, about 2 min per side. Set aside. Lower heat to simmering and cover. 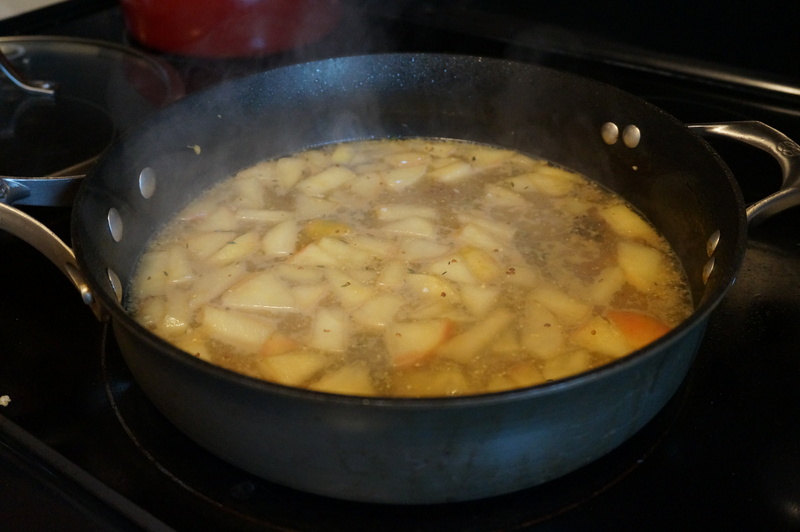 Simmer about 15-20 minutes until reduced by half. In a large casserole dish sprayed with cooking spray, spread an even layer of rice and lentils. Cover with kale and pour remaining chicken broth over top. 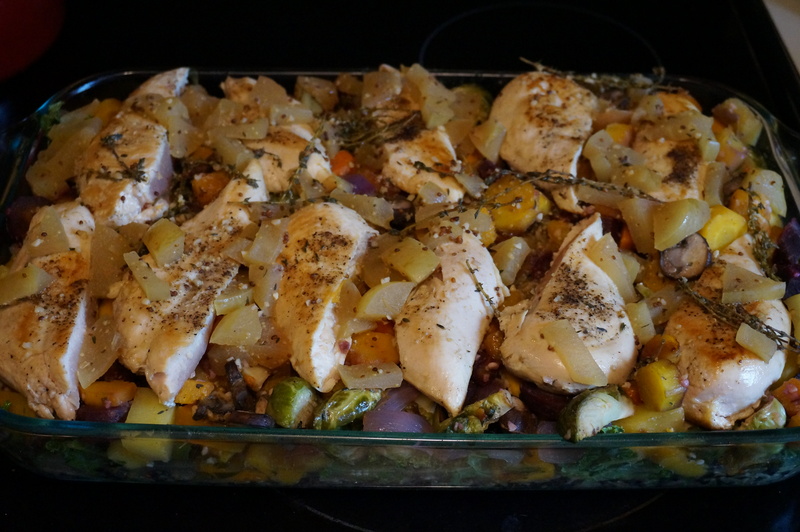 Add roasted vegetables and wedge in the chicken breasts. When sauce is done, pour over top of chicken. Cover with foil and bake at 350 deg until chicken is cooked through and rice is al dente, about 40 minutes. Uncover and cook 10 minutes more. 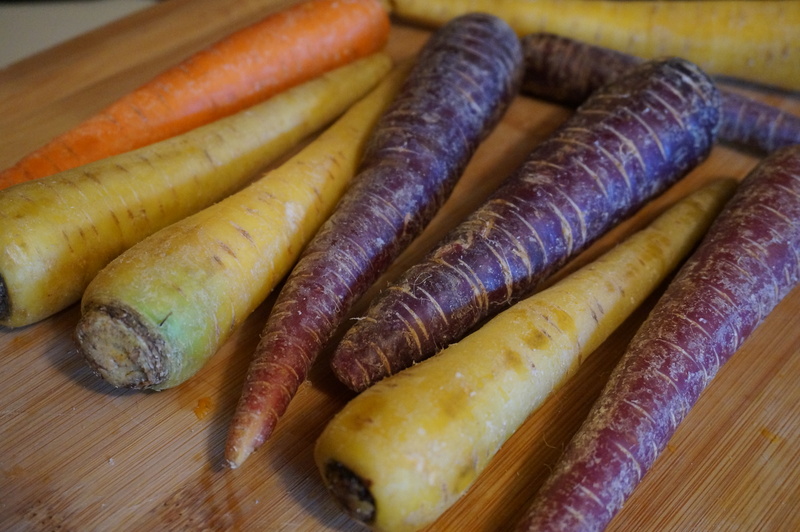 Fun tri-color carrots from TJ’s! Plated and served! Try topping with some goat cheese or a dollop of plain Greek yogurt! 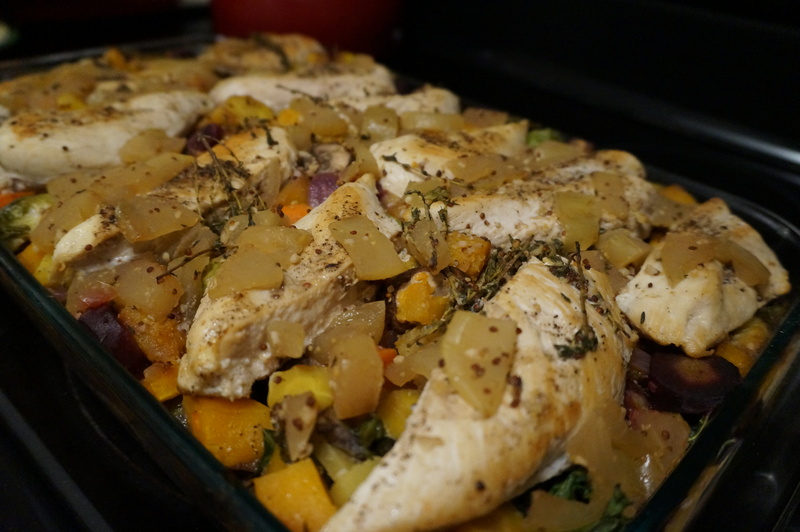 I hope you enjoy this healthy Harvest supper just as much as we did! 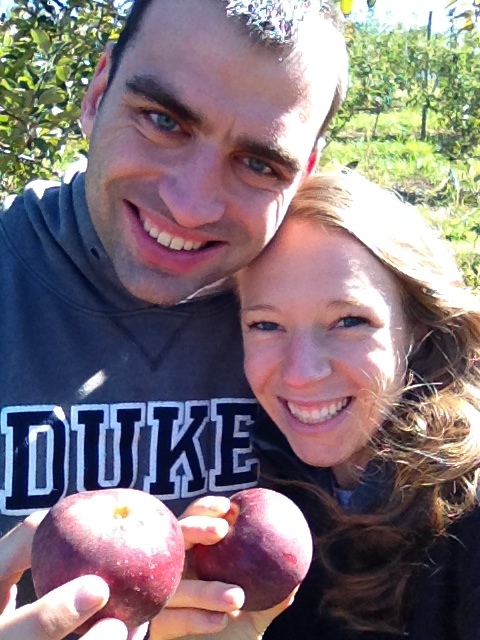 P.S.Keep an eye out for a special post from our trip to Carter Mountain next weekend!